Paris shooting: An eyewitness account from the Stade de France. A photo taken from the stands of the Stade de France before the match. This article, which originally appeared on Slate.fr, was translated by L.V. Anderson. What better way to finish up a long week of work than to go to a football match? On November 13, on top of seeing the French team face off against Germany, I’m delighted to finally see Patrice Evra, Paul Pogba, and Sami Khedira on a pitch, three players who play for my favorite club, Juventus from Turin. Barely out of the newsroom of Slate.fr, I meet up with my brother and two friends to head for the Stade de France. A sandwich at McDonald’s, a beer, and a cigarette later, we’re settled in for the national anthems. At gate K, in the north bleachers where we’re sitting, the atmosphere is relaxed, there’s singing, there’s buzzing. All around us are families, groups of friends, couples, and lots of children. Seventeen minutes after kickoff, in between shouts of “Allez les Bleus!”, a first explosion rings out in the stands. We don’t suspect anything. Around us, no one seems to be worried; a few cheer, thinking that it’s a cherry bomb, “common in the vicinity of stadiums,” L’Equipe explains Saturday morning. That’s what I think, too—the noise sounds like what I’ve heard in other stadiums in Italy—but a friend has doubts. There’s very little chance someone could have brought that kind of explosive device into the Stade de France, given the extreme security measures at the stadium entrance, and the noise that we just heard seems a lot more powerful. The chanting picks up again, and, suddenly, a second detonation can be heard. Shortly before halftime, Olivier Giroud opens the scoring for France. During the break, stadium workers block access to the passageways and bathrooms for several minutes. My friend, a regular at the Stade de France, wonders anew: This has never happened to him before. The gates finally open, but outside, about a hundred security agents are preventing people from leaving the stadium, without anyone really understanding why. Still, no one around us seems to be worried, even as—though we don’t know it yet—François Hollande has slipped out of the stadium to return to Paris. In the middle of the second half, my cell phone vibrates. Six texts arrive all at once around 10:10. Friends are asking for news, trying to find out if I’m safe. I don’t understand, and at first I think it’s a joke. The gridlocked network in the stadium prevents everyone from getting the mobile news alerts that are starting to go out (a little before 10:30, 20 minutes before the end of the match, AFP releases its first alert reporting on coordinated explosions and shootings in the Paris region). It’s impossible to access the Internet, Twitter, or Facebook. 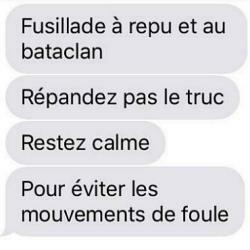 Texts trickle in, confirming the attacks near the stadium and also in several other parts of Paris. Around us, no one knows yet. We stay discreet in order to avoid any panic in the stands. We make out police and fire-engine sirens and a helicopter flying overhead that we haven’t paid attention to until now. Below us, stadium workers are looking agitated. We’re not watching the match any more; starting now, our eyes are riveted to our phones, which refuse to work. In the final minutes of the match, André-Pierre Gignac scores a second goal for France. It’s at this moment that we leave the stadium. It’s also at this moment that—I’ll learn later—on TF1, which hasn’t interrupted the broadcast of the match, Christian Jeanpierre informs viewers of the events in progress in Paris and announces that he’ll hand over the microphone for a special report as soon as the final whistle blows. Parents are trying to reassure their children as we get to the RER station. We manage to catch a train and arrive at the Gare du Nord [in northern Paris]. Normally jam-packed, the passageways are empty and quiet. Armed policemen, some of them with their faces covered, yell and order us to evacuate the station. Everyone runs and jostles to the square in front of the train station where people are waiting, not knowing if they can go home or if it’s better to wait for police instructions. We flag down a bus that will take us home to the Jaurès neighborhood of the 19th arrondissement. Several minutes after taking shelter, we welcome in four young women who are seeking refuge using the hashtag #porteouverte. The evening ends in front of iTélé’s live broadcast tracking the events. On the screen, we see the pitch of the Stade de France, where we just left, overrun with people, and the damage from one of the suicide bombings on the outskirts of the stadium, near the McDonald’s where we’d stopped to grab a bite before the match.